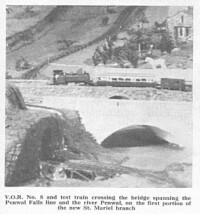 Reprinted from the August 1957 issue of Model Railway News. This really was a time of total scratchbuilding. Although it might seem crude by todays standards, this was a very creditable effort. The images are linked to larger versions of the picture. The pictures contain several "Matchbox" road vehicles. These are now very collectable. It all began towards the end of 1951, about the time that 2 mm. 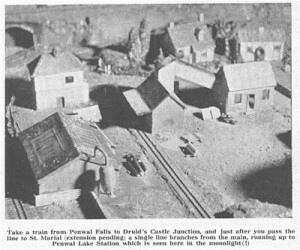 scale was gaining a footing in the model railway world, and making its presence felt in the pages of the hobby's then rather thin and meagre periodicals. For years I had cherished the thought of possessing a scale layout, but, like very many other would-be modellers, lack of space prohibited such an undertaking. The urge, however, though dormant, was still alive, and upon reading of the successful activities of the pioneers of this scale, I realised that now was the time to start something rolling. Two millimetre scale would allow of a sectional or folding layout that could be kept in a small space, ready for assembly in a matter of minutes. On these lines then, I commenced operations. Construction of a G.W.R. "County" 4-6-0 was the first item on the programme. Consideration was given also at the same time to trackwork, and many and varied experiments were carried out. One evening, however I was busy working on the " County", the kitchen table littered with the inevitable paraphernalia inseparable from the modeller, when my friend Bill Wallace called in. Having heard nothing as yet of my railway "bug", he was grossly intrigued, for he, too, was the possessor of a latent urge to indulge in this most fascinating of hobbies. The result was a combined operation in which he would press on with the construction of a scenic layout, leaving me free to progress with the provision of stock and trackwork. Progress was certainly made; when about the turn of the year, narrow gauge modelling came to the fore. We were both greatly impressed by the possibilities of such schemes even in 4mm. scale, the balance between full size 2mm. and narrow gauge 4mm. being not far from even. After all, there is something most attractive about a narrow-gauge line and to use the present-day parlance of rock 'n' roll addicts, "it gets you". Well, it "got" us all right, so much so that we came very near to forsaking that which we had been so eager to grasp and recommence afresh in 4 mm. scale narrow gauge. We debated the position almost interminably, and after much wagging of tongues and of heads, for we both were most reluctant to abandon "OOO", we came at last to a decision. It would, I think, be better put had I said that the ultimate answer hit us rather forcibly - extremely hard in fact and came about in this way: I had been looking around for a mechanism to fit into the tender of the "County" and to my chagrin, in vain, for none could be used without a major operation on either the mechanism itself, or upon the tender, which, of course, would completely spoil its appearance. It would be far simpler to build a motor for the job. Dejectedly, I went home and had another look inside the tender. A motor to fit the available space would have to be very small. Anyway, I could but give the matter some thought. In the meantime I had made some line drawings of a Vale of Rheidol locomotive to a scale of 4mm., and I took solace in contemplating these awhile. I wondered how big this would be in 2mm. scale. I remembered some nasty little digs that had been made about this scale and to have read somewhere a remark to the effect that someone would one day produce a 2mm. narrow gauge loco. down to the last rivet; all very scathing, of course. Well why shouldn't somebody produce one ? Why not, indeed? After all, who's going to worry about the absence of rivets ? I certainly would not. Here, I thought, was a challenge, so out came the drawing requisites and a drawing was made to 2mm. scale of V.O.R. No. 8. This was carefully studied and the cab space compared with that available in the tender of the "County". There was surprisingly little difference. I resolved there and then to construct this little engine for experimental purposes. No time was lost in doing so. I did not possess a lathe so everything bar the wheels had to be made by hand, the wheels being turned for me by a local watchmaker. The locomotive having been completed, the next job was to design a mechanism to fit the cab. This took a bit of doing, involving considerable trial and error attacks. Eventually, having wound seven armatures, or rather the same one seven times, success was achieved and the motor whizzed around. A short length of test track was built up of drawn brass wire, the gauge being 4mm. Keeping my fingers crossed, the locomotive was placed on the track and current from a 12 volt dry battery applied to the rails. I needn't have bothered crossing my fingers, for apart from a few spasmodic jerks and furious buzzing, nothing happened. Yet, off the rails, the locomotive spun its wheels merrily. The engine was provided with split axles, and the chassis insulated from the body, so there was nothing wrong there. I tried again after cleaning the rails but with still the same result, although to be fair, I should mention that at one stage the locomotive romped along for a distance of about three Inches. After that, it staged a sitdown strike and would not budge another millimetre, never mind an inch. Despair very nearly overcame me. However, on my next visit to the local model shop, I obtained a coil of nickel-silver wire and decided to have another try with this material. After drawing the wire, a new strip of track was made. Out came the battery, the locomotive placed on the rails and the current applied. This time I did not cross my fingers. If it went, it went. If it didn't, it didn't, and that would be the end of the affair. To my amazement it went. Further trials proved it to have ample power to pull a load of four or five coaches, both on level track and up a gradient of 1 in 12. Thus was born the Vale of Penwal Railway though neither Bill nor I was aware of it at the time. Whilst I was involved in the "battle of No. 8", Bill was serenely proceeding with his layout. He had modelled a fine representation of Liverpool Riverside Station, including the Princes Dock. Having successfully accomplished narrow gauge "OOO", it was natural that we should think of incorporating such a line in the larger scheme. There followed more discussions and tongue wagging, and a critical inspection was made of the original plans. The outcome of all this showed that such incorporation would result in a layout far too big for the available space; it would also slow down progress to such an extent that it would be a very long time before we could get anything running, and that, of course, was the main objective. It was decided, therefore, to concentrate on narrow gauge. Riverside was accordingly abandoned, with Bill once more making a start on a layout that would eventually form part of a larger one, but could, as soon as it was completed, be used independently and allow us to indulge in some running, and so relax from time to time during the construction of further sections. 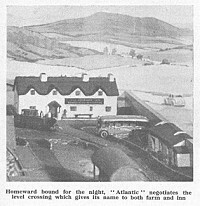 The next step was to provide a main terminal, and bearing in mind our desire to later incorporate a standard gauge line, Dinas Junction of the erstwhile Welsh Highland Railway, positively cried out to be modelled. It's appeal gripped us both and I forthwith commenced upon a 2 mm. scale reproduction, to be housed in a folding section measuring, when open 4 ft 8 in. x 16 in. x 3 in. It was found necessary, however, to somewhat compress the station in length and to position the engine shed nearer to the edge of the layout than it should have been. The station house, too, differs from the original in that it is of a more modern type, as I was unable at the time to obtain the necessary data to produce a replica. The rest of the scene, judging from the number of folk who have immediately identified it with its prototype, presents quite a good likeness of the Junction as it used to be. There followed two smaller sections which met to form an L-shape. These linked the terminal to Bill's layout, the line climbing all the way, on a gradient of approx. 1 in 37, through typical Welsh countryside complete with farm, inn, main road and an ungated level crossing. 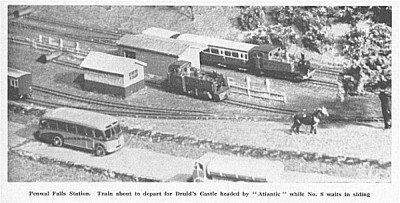 Having reached thus far, we eased off from our labours for a while and revelled in some actual running, the line by now possessing two coaches and two brake vans, Vale of Rheidol prototypes built to partner No. 8. Advantage was taken during this lull to consider future extensions and to decide upon a name for the system. The majority of narrow gauge lines in England and Wales seemed to meander through valleys, so it was decided that our little railway should do likewise, and as Bill had incorporated a lake upon his layout we felt justified in planning a river to feed it. The river, of course. would lend it's name to the " valley " which in turn would bestow it upon the railway. As the scenery on the layout was intended to typify Welsh countryside, we desired a name that would fit in with this but English enough to be pronounceable, yet suggestive of Celtic origin. After a good deal of searching among books and maps, we hit on quite a simple solution, that fitted our needs perfectly. To the first three letters of my Christian name were added the first three letters of Bill's surname, and so the Vale of Penwal Railway came into existence, almost two years after our excursion into 2mm. scale. In November, 1953 there appeared in one of the hobby's magazines drawings of a Campbelltown and Machrihanish locomotive; there being two, identical apart from minor fittings. I decided to model "Atlantic" and so provide the V.P.R. with a second engine. This was built on the same principles as No. 8. Indeed, I would emphasise that there is no alternative method in constructing 2mm. narrow gauge locomotives. The body is made first then the frames and lastly the mechanism to fit the body. In the case of "Atlantic" the cab was bigger than that of No. 8 and it was possible to make the motor slightly larger, although the same number of windings were retained at 130 per pole, there being six. This time, however, everything went swimmingly, for the locomotive, on completion, passed her trials at first go. With these two then we passed some weeks of very pleasant operations. In June of 1954 we were asked to exhibit the layout at a garden fete organised by a local high school. This rather shook us, for we were very doubtful of the capabilities of such small mechanisms to stand up to prolonged running. However, with some trepidation we agreed to the request, and somewhat anxiously awaited the great day. It came and went. So did the locomotives for they behaved perfectly, much to the delight of everyone - and to our great relief. A month later we attended a second fete with equally satisfying results. We now felt that our efforts had been well worth while and that 2mm. scale narrow gauge was not only possible but definitely practicable. We, therefore, pressed on with the layout and now have three further sections in operation, the line now terminating at Penwal Falls Station, which is a replica of the layout at Devil's Bridge (G.W.R. Vale of Rheidol Rly.). Plans are in being for a branch line to the contemplated village of St. Mariel, and to this end Bill's layout has been modified, so that the station thereon - Penwal Lake - now forms a junction for the two lines. There is nothing unorthodox about the layout, apart from the fact that there is far more scenery than on the average model railway. This being made possible, of course, by virtue of the scale. The sections comprise a "box" of 3/16in. obechi to the dimensions described, strengthened by a framework of 1/2in. square balsa. It follows that they are both light and extremely strong. Scenery is built up of card and alabastine, green flock being used for grass. The lake and also the river which flows through the last three sections are of Perspex treated with jewellers cement to simulate the rippling of the water, and placed over a bed formed of plaster and ballast, suitably sprinkled with dried moss to give the effect of weeds. Buildings differ in no way from their larger cousins, even the judicious use of 4 mm. building papers showing no obvious out-of-scale comparison. Trees are made of wire and tea leaves on the principle laid down by Mr. Neighbour. Trackwork, however, does depart from the usual practice, so a few words on this subject may not be amiss. Rail is made of nickel-silver 20 s.w.g. wire, which after annealing is drawn through a jig made up of silver steel rods. A 6in. length of wire gives approximately one foot of rail and, is therefore, most economical. Track bases are made of 1/32 in. ticket board cut to the required length and shape the position of the rails being drawn thereon in pencil. Sleepers of thin card are then fixed on with rubber adhesive which allows the pencil lines to show between the sleepers. The base is then stitched along the outside of each line, with 15 amp. fuse wire passing over the first sleepers under the second, over the third and so on to the end of the length; the necessary holes to facilitate the stitching being first made with a two-pin tool that automatically ensures the gauge being correct. Rail is then soldered to the wire overlapping alternate sleepers. The completed length of track is now provided with an underlay of felt affixed with rubber adhesive which latter substance is also used to fasten the track to the layout. The resulting line is strong, resilient, and very quiet, and up to now, no difficulties have arisen from temperature variations. The layout is operated on the cab control system, power being derived from 12 volt dry batteries. Their average life, owing to the locomotive's low current consumption, is about four months. We, therefore, have no complaints on this score, besides being completely independent of mains supply when " on tour", which very often can be a great advantage. Such then is the story to date of the Vest Pocket Railway, so called because several complete trains can be carried in four small boxes which fit into each pocket of the normal waistcoat. You don't wear a waistcoat ? Well, what's in a name anyway ?